Reflectance confocal microscopy (RCM) is a relatively novel, light microscopy-based, noninvasive imaging tool that permits visualizing structures in living skin in real time with resolution comparable to that of histological analysis. Apart from its benefit as a diagnosis tool, RCM also allows monitoring the evolution of the skin over time and in response to treatment, e.g., photodynamic therapy and postsurgical healing. 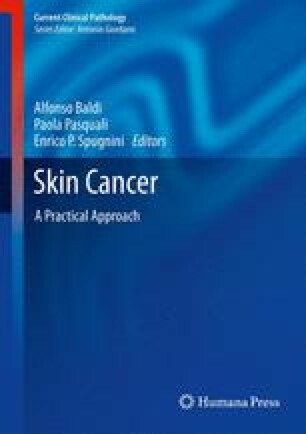 In this chapter, we provide a brief overview of the fundamentals of RCM and then focus on its employment as a diagnosis and monitoring tool in skin cancer and other skin pathologies. is the pattern found in basal layer keratynocytes, which appears as one layer of small cuboid nucleated cells usually more brilliant due to the high content in melanin. It is the confocal pattern usually observed at the basal layer in dark phototypes. found in BCC refer to those areas where the stroma reflectance is higher than the tumor islands. is the confocal pattern found at the dermoepidermal junction and it appears as bright circular structures made of basal cells that surround certain darker areas, which correspond to the dermal papillae. is the pattern found in normal keratinocytes of the granular and spinous layers. These are cells with dark central oval-shaped nuclei and bright cytoplasm. refers to the elongated monomorphic nuclei along the same axis of orientation and present as a general confocal feature of BCC (Basal cell carcinoma). It often reflects as peripheral palisading.